45.8mm stainless steel, coated with high tech vulcanized rubber, 42 hour power reserve automatic chronograph movement, with date. The blue dial is etched with images of catamarans, the case back has a stainless steel silver medallion etched with an image of the Artemis racing sail boat. 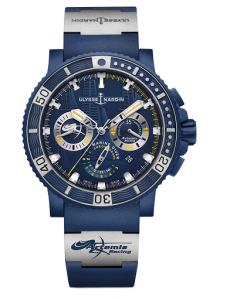 It is available on blue rubber strap with the ARTEMIS logo, and titanium folding clasp. Follow us on INSTAGRAM and FACEBOOK We’d love to have you!